Shadow Scale is a lot of book. It's right around 600 pages and for me, it felt long. For the amount of writing there was, not a whole lot happened. Like in the first book there's lots of descriptions and imagery, which is great, but sometimes it felt a bit much. I just wanted to get to the action and adventure instead of feeling almost weighed down by the constant descriptions. In some parts I felt like we lost some of the characters and their personalities. I had some trouble understanding their decisions and truly caring what was going to happen to next. It's like some parts were so great and then there were other parts that felt long and just alright. The plot was a little iffy for me too, it was like everything either happened all at once or nothing seemed to be happen for a while. I was absolutely not a fan of the ending. I can't say much without spoiling it, but I just feel so let down by it. 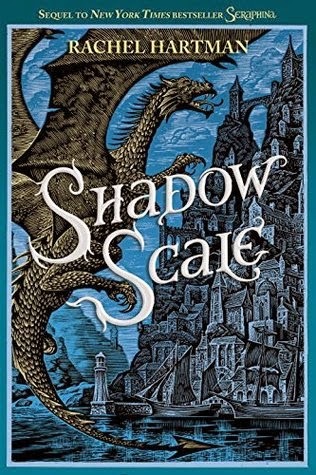 I was really looking forward to Seraphina's sequel, Shadow Scale, but I was unfortunately let down a bit. This might be due to my high expectations after enjoying the first book so much, but I just really wanted more for our beloved Seraphina! I'm usually a fan of description, but there was so much of it that I felt like it lost the story in some places. Although I might not have loved this book, I enjoyed the world Hartman created and still adore the Seraphina from the first book. You can check out my review of Seraphina here. "I just wanted to get to the action and adventure instead of feeling almost weighed down by the constant descriptions." ^^^I hate when this happens :/ It can ruin otherwise amazing story pretty quickly for me. I haven't started this series yet but Seraphina is on my TBR. I agree, it really can ruin a good story! By the way, I'm a new follower and I love your blog's color scheme! I hope you love this one as much as the first and that you find the characters to be awesome!